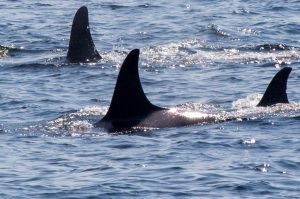 J-Pod is one of three pods that belong to the endangered Southern Resident Killer Whale population. It is believed that this population has used the Salish Sea for tens of thousands of years to hunt their preferred prey- Chinook salmon. The population is the most highly studied population of marine mammals in the world, and are regularly featured on our whale and wildlife tours from Victoria. From over four decades of intensive studies and observation, the Southern Residents have each been identified by each members’ unique saddlepatch and dorsal fin. They have all been given an alphanumeric name (letter and number) and a common name. 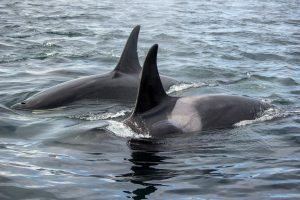 The whale watching community knows each individual in this extended family, because of their unique markings, dorsal fins, who their family is and even by their personality characteristics. Providing information about each whale would not be possible without the work of the Center for Whale Research, the Adoption Program of the Whale Museum and the incredible documentation of this community by Orca Network. 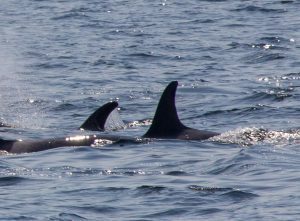 Slick has three living offspring- one son named Mike (J-26) and two daughters named Alki (J-36) and Echo (J-42). She lost her son Keet (J-33) in 2010 and her daughter Scarlet (J-50) in 2018. Slick is known as one of the most successful mothers in the population and is easily recognized by her unique saddlepatch that looks very different from one side of her back to the other. Princess Angeline was named after the daughter of Chief Seattle, the Duwamish elder for whom Seattle is named. 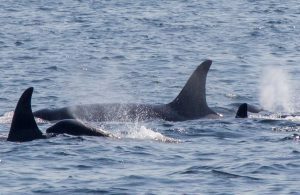 She has three living offspring- Tahlequah (J-35), Moby (J-44) and Kiki (J-53). She lost her daughter Polaris (J-28) and grandson Dipper (J-54) in 2016. Princess Angeline has a small opening at the top of her saddlepatch on both sides. Shachi’s first calf, J-29, was born in 1993 but unfortunately only lived for a few weeks. 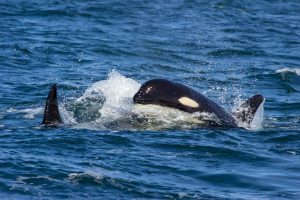 Like other young female orcas, Shachi was often seen babysitting other young calves in her pod until July 1st, 2005 when she gave birth to her daughter Eclipse (J-41). She has not had any other offspring since and has reached menopausal age for orcas. Oreo is a female that has had many pregnancies, but not many successful births. 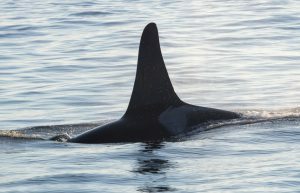 She is the mother of Cookie (J-38), a male born in 2003. 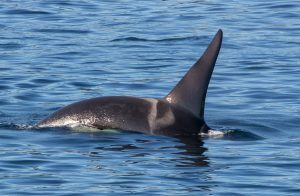 Oreo lost her son DoubleStuf (J-34) in December of 2016 from an apparent ship strike. Oreo is a doting mother who is never found far away from her son. Her family has always been close to the J-11 matriline which includes Mako (J-39) who is the same age as Cookie. Over the years it has not been uncommon to see Oreo babysitting Mako as he and Cookie loved to play together. Mike is a very special whale as he was named after the father of orca research- Canadian biologist Dr. Michael Bigg. 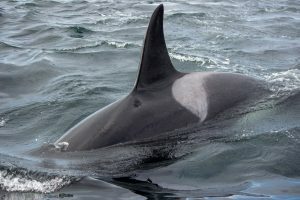 Shortly after Dr. Bigg passed away in 1990, Mike was born and named in honour of the man who discovered that individual orcas can be identified by their unique saddlepatches and dorsal fins. He also discovered that there were different types of killer whales off the coast of B.C. that he named Transients (mammal-hunters) and Residents (fish-eaters). Mike is a wonderful brother and spent lots of time with his ailing younger sister Scarlet (J-50) before she passed away in August of 2018. Blackberry is one of the easiest males to identify in the Southern Resident population with a very defined hook-shape on the left side of his saddlepatch and slight black opening at the top of his saddlepatch on his right side. Blackberry and his sister Tsuchi (J-31) raised their younger brother Mako (J-39) after they lost their mother Blossom (J-11) when Mako was just 5 years old. 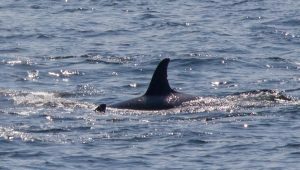 Tsuchi has a very plain saddlepatch making her more difficult to identify, but she is never far from her two brothers Blackberry (J-27) and Mako (J-39). Tsuchi has never been seen with a calf of her own, but has always taken wonderful care of her little brother as they lost their Mom at a young age. Her and her family are often seen traveling with the J-22 (Oreo) matriline. Tahlequah is famous around the world as she was witnessed struggling with the loss of her newborn daughter in the summer of 2018. 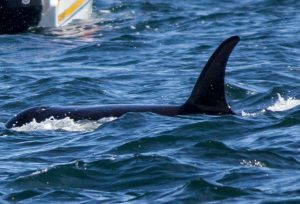 Tahlequah carried her deceased calf on the top of her head for at least 17 days and for over 1000 miles, the longest grieving episode ever recorded for an orca. She is also the mother of Notch (J-47) who was born in 2010. Tahlequah travels closely with her mother Princess Angeline (J-17), her brother Moby (J-44), her sister Kiki (J-53) and her niece Star (J-46). 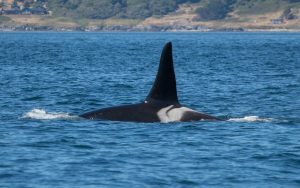 Alki is part of a large family and is the third offspring born to Slick (J-16). She has a brother named Mike (J-26) and a sister named Echo (J-42). 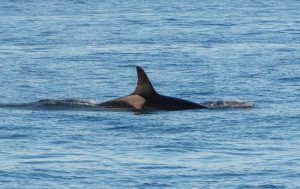 Alki had her first calf Sonic (J-52) in 2015, but due to a lack of Chinook salmon, Alki was unable to provide enough food for her son and he passed away from starvation in September 2017. 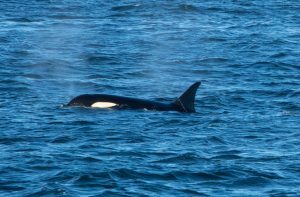 Hy’Shqa is now the eldest female in her matriline which descended from the oldest known orca in the world- Granny (J-2) who passed away in October of 2016. She had her first calf, a son, named T’ilem I’nges in 2012. Hy’Shqa has a younger sister named Suttles (J-40) and a younger brother named Se-Yi-Chn (J-45). Each member of this family is named at traditional potlatch ceremonies by the Samish Nation. Hy’Shqa’s name means “blessing” or “thank you” in the Coast Salish/Samish language. Her mother was named Samish (J-14). Cookie is the only living offspring of Oreo (J-22). He lost his older brother DoubleStuf (J-34) in December of 2016. Cookie always swims close to his mother and spends lots of time with podmate Mako (J-39) who is the same age. Cookie is maturing into an adult, gaining a taller and straighter dorsal fin as seen in adult male orcas. Mako is a teenage male who is starting to display the physical characteristics of an adult. His dorsal fin is becoming taller and straighter as he reaches maturity. He is the younger brother of Blackberry (J-27) and Tsuchi (J-31). Mako lost his mother when he was just five years old, but his older siblings took great care of him and have raised him into a young adult. He is often seen swimming with Oreo (J-22) and her son Cookie (J-38) who happens to be the same age as Mako. Suttles is a member of a very iconic family of Southern Residents. 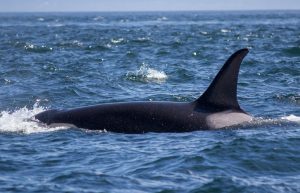 Her great grandmother was Granny (J-2), the oldest known orca in the world who died in 2016 at the age of 105 years old. Suttles is expected to start having her own offspring as she is now a mature female. She travels with her older sister Hy’Shqa (J-37), her younger brother Se-Yi-Chn (J-45) and her nephew T’ilem I’nges (J-49). 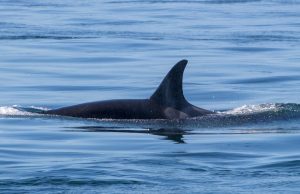 Eclipse is the second calf of Shachi (J-19) and cousins with Blackberry (J-27), Tsuchi (J-31) and Mako (J-39). She was first spotted on Canada Day (July 1st) in 2005. She is known as the youngest Southern Resident to ever give birth at the age of ten when she had her son, Nova (J-51). Echo was born to Slick (J-16), one of the most reproductively successful mothers in the Southern Resident community. 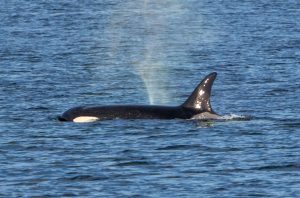 Unfortunately, only two of her siblings are still alive, Mike (J-26) and Alki (J-36). The right side of Echo’s saddlepatch looks very similar to her mother’s with a boomerang-shaped black opening. Echo is always seen traveling close to her family members, especially her sister Alki. Moby is the third calf born to Princess Angeline (J-17). 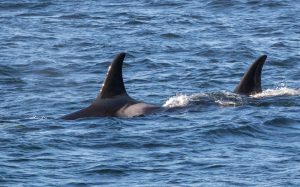 He has two living sisters named Tahlequah (J-35) and Kiki (J-53). His family has suffered several losses in a short time span with the losses of his aunt, nephew and niece. He spends much of his time with his niece Star (J-46) and his nephew Notch (J-47) as all three of these whales were born within a few months of each other. 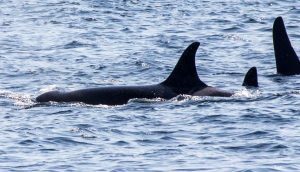 Se-Yi-Chn is the youngest off Samish’s (now deceased) offspring. He has two older sisters named Hy-Shqa (J37) and Suttles (J-40). He also has a nephew named T’ilem I’nges (J-49). Se-Yi-Chn and his family members have unique names given to them by the Samish Nation. Fittingly, his name means “younger sibling” in the Coast Salish/Samish language. Star is a very strong whale who has suffered incredible losses during her young life. Star was the first offspring born to Polaris (J-28). Star was seen trying to feed her mother and young brother Dipper (J-54) when both were suffering from malnutrition. Sadly, she lost both her mother and brother in October of 2016. She travels close to her grandmother Princess Angeline (J-17), her aunties Tahlequah (J-35) and Kiki (J-53), her uncle Moby (J-44), and her cousin Notch (J-46). Notch is the only living offspring of Tahlequah (J-35). Notch was born within a few months of his Uncle Moby (J-44) and his cousin Star (J-46), therefore this trio have always been very close. Notch had a tough summer in 2018 when his mother gave birth to his sister who lived for less than one hour. Notch has an auntie named Kiki (J-53), who is five years younger than he is. 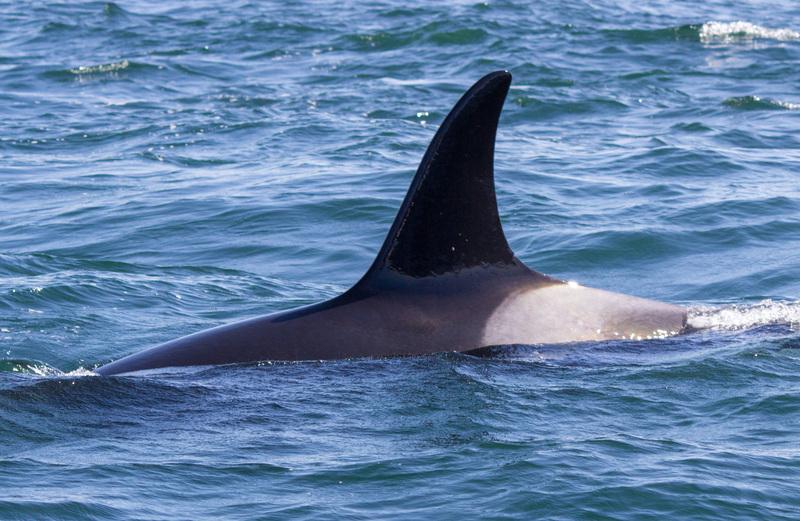 Notch is very easy to pick out because he has a large square-shaped notch in the trailing edge of his dorsal fin. T’ilem I’nges is the first born calf of Hy’Shqa (J-37). He has an aunt named Suttles (J-40) and an uncle named Se-Yi-Chn (J-45). Like other members in his family, T’ilem I’nges was named at a traditional potlatch ceremony by the Samish Nation. His name means “singing grandchild”. 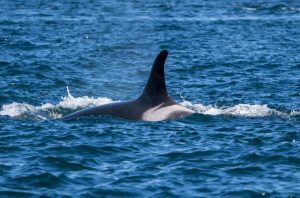 He is the grandchild of Samish (J-14), the great grandchild of Sissy (J-12), and the great great grandchild of the infamous Granny (J-2), the oldest known orca to have ever lived. Nova is the first calf of Eclipse (J-41) and is famous for being born to the youngest known mother in the Southern Resident community. Nova’s family is often seen traveling with the J-17 matriline and has been seen playing with Notch (J-47) since he was very young. Kiki is the youngest of four offspring born to Princess Angeline (J-17). Her living siblings are Tahlequah (J-35) and Moby (J-44). She lost her sister Polaris (J-28) and her nephew Dipper (J-54) to starvation in October 2016. She has an older niece named Star (J-46) and an older nephew named Notch (J-47). Kiki was born during the so called “baby boom” of 2014-2015.